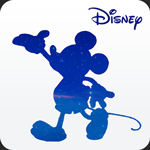 I was VFX supervisor and compositor for the trailer for the Disney Animated app, created by Touchpress. The work here involved compositing of multiple passes from a motion control camera. Rigs were painted out and some of the iPad screens were enhanced or replaced. The app won Apple's iPad of the Year award for 2013.